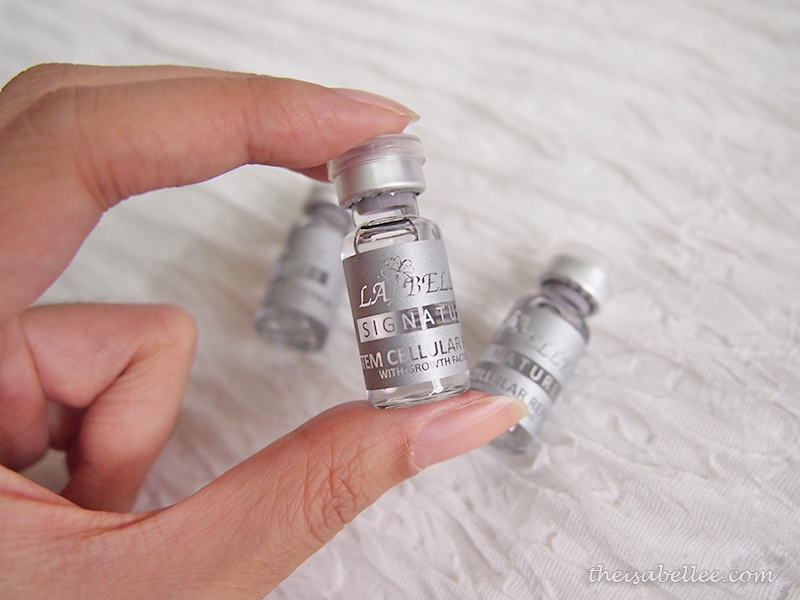 Isabel Lee | Malaysian Beauty & Lifestyle Blogger: [Review] La Belle Skincare - Do Ampoules Really Work? 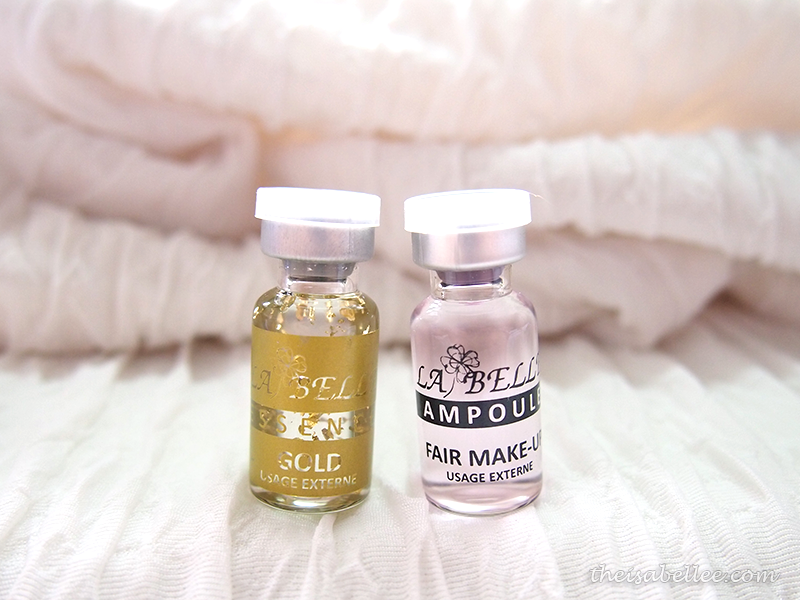 [Review] La Belle Skincare - Do Ampoules Really Work? 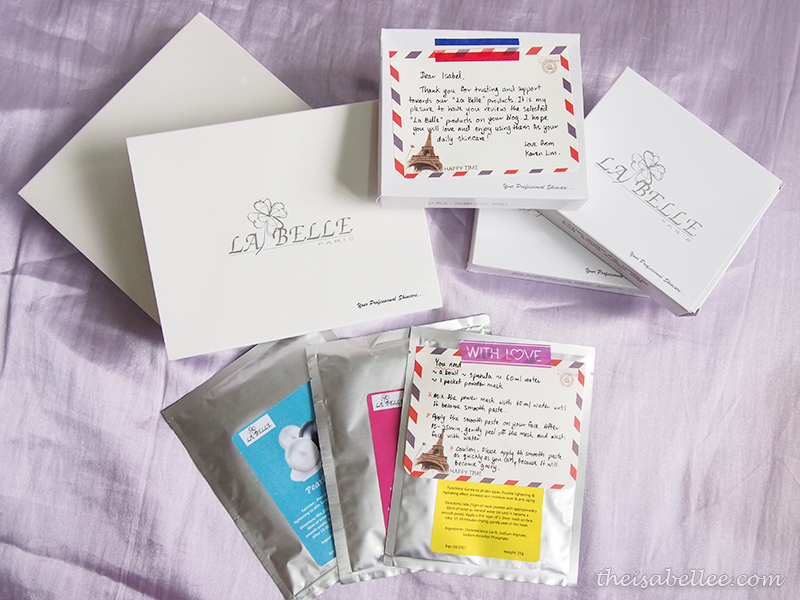 I was complaining to Karen from De Beaute (she sells La Belle products) about how dry my skin is. Any drier, cracks will appear. 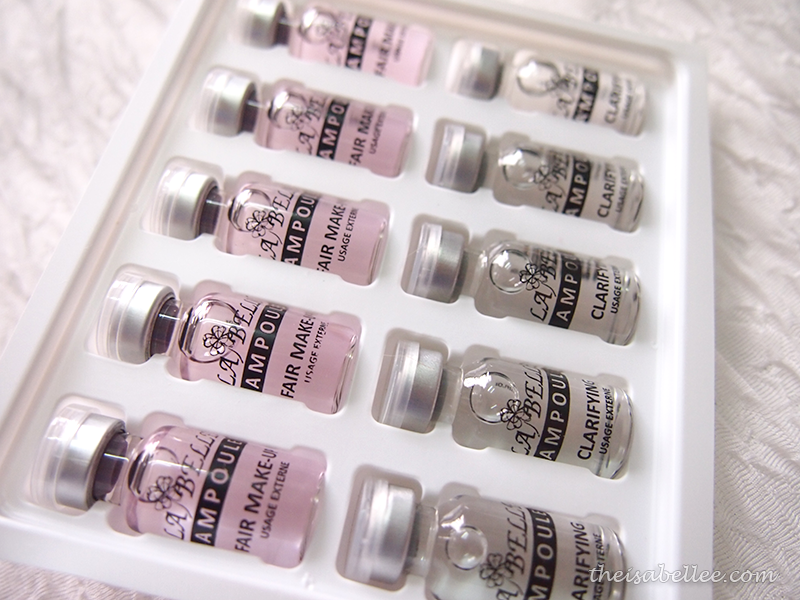 Then she recommended these little bottles of magic. I was a bit skeptical at first but heyy gotta try to know right? Besides.. doesn't it just look pretty?? First a lil intro to the products. 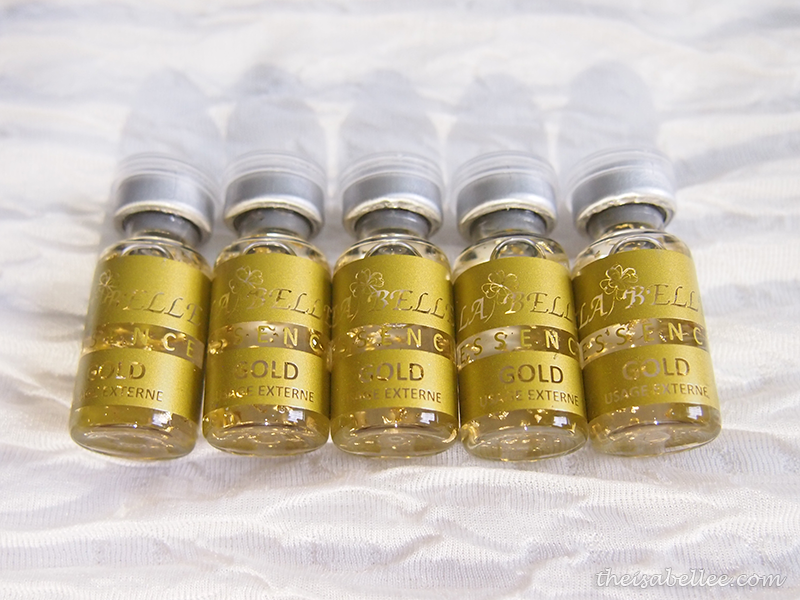 Uses 24K Pure gold leaf to help slow collagen depletion and prevent sagging skin. It also assists in protection against pollution effects & damaging UV rays. 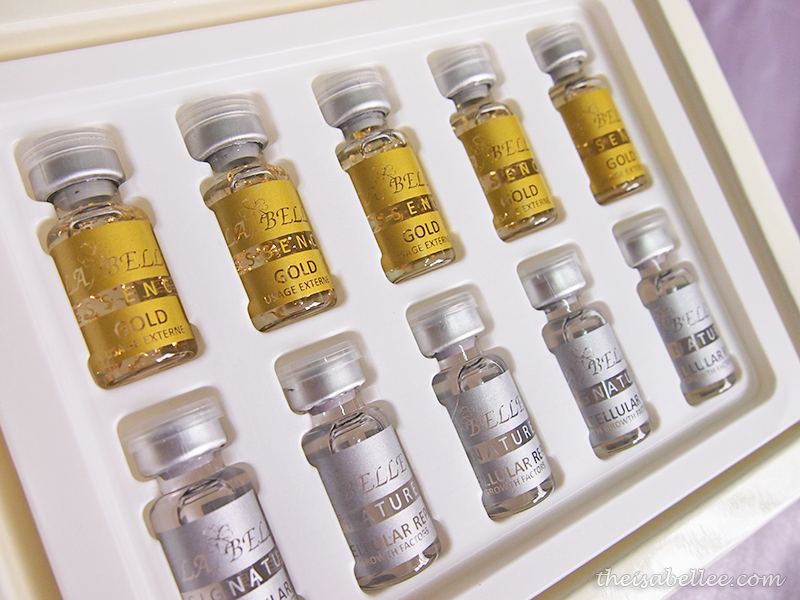 Gold speeds up cellular processes and active regeneration to regenerate healthy, firm skin cells and reduce fine lines & wrinkles. You can see the gold flakes in these! Contains high concentration of HA and blends with natural herbal extract, it's the perfect combination to hydrate and & rejuvenate skin. It locks moisture and restores elasticity of the skin, hence minimizing wrinkles and gives the skin a youthful appearance. 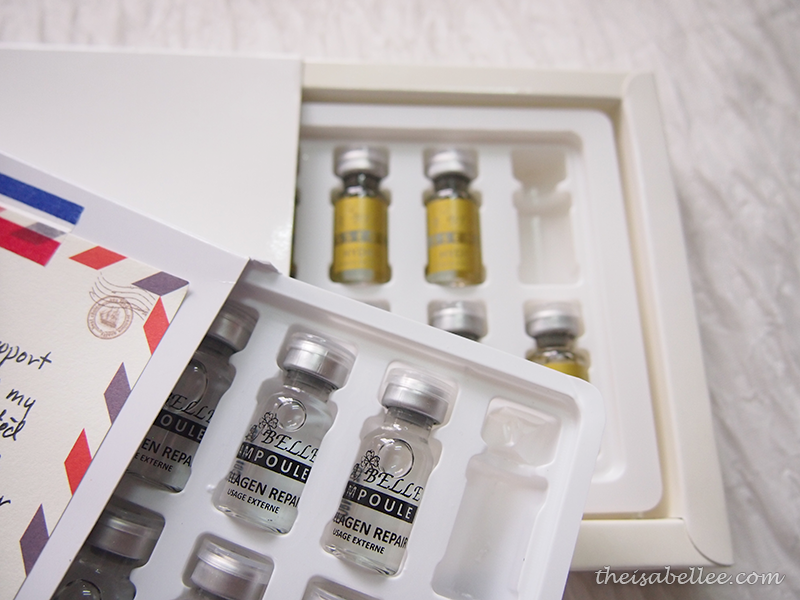 Combined 2 in 1 formula, Collagen & DNA Repair ampoule. Contains native collagen and hydrolyzed collagen that re-hydrates and firms loose and sagging skin. Meanwhile, it helps repair, smoothe & refine the skin texture. Anti-ageing, moisturizing, collagen and elastin strengthener. Removes uneven outer dermal layer by dissolving existing post inflammatory scars and also fills in depressed scarring. Methylsilanol Hydroxyproline Aspartate is often used to help keep damaged tissue from losing its elasticity and texture. 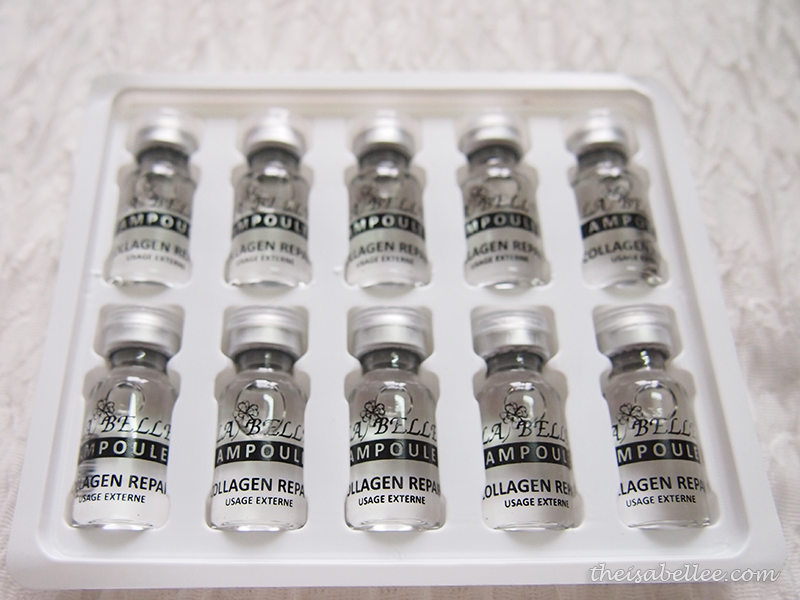 Stem cell activator will activate sleeping stem cell and intensify new cell regeneration from inner deep of your skin. This replacement cycle will get rid of scarring and necrotic tissues, leaving young smooth and flawless youth skin. Clarifies dark spots /pigmentation. Contain whitening and lightening properties to suppress melanin formation which helps lighten & brighten skin tone. Detoxifies the skin and tightens pores. Skin glows with more radiance. Use this after a long tiring night to avoid waking up to dull skin. Revitalizes tired skin. Moisturizes and provides essential minerals needed by the skin cells to rebuild the membranes for its normal functioning. Rejuvenates, smoothes the skin & refines it texture. Restores the structure of a young, firm & clear complex. These bottles are meant to be combined for the best effect. 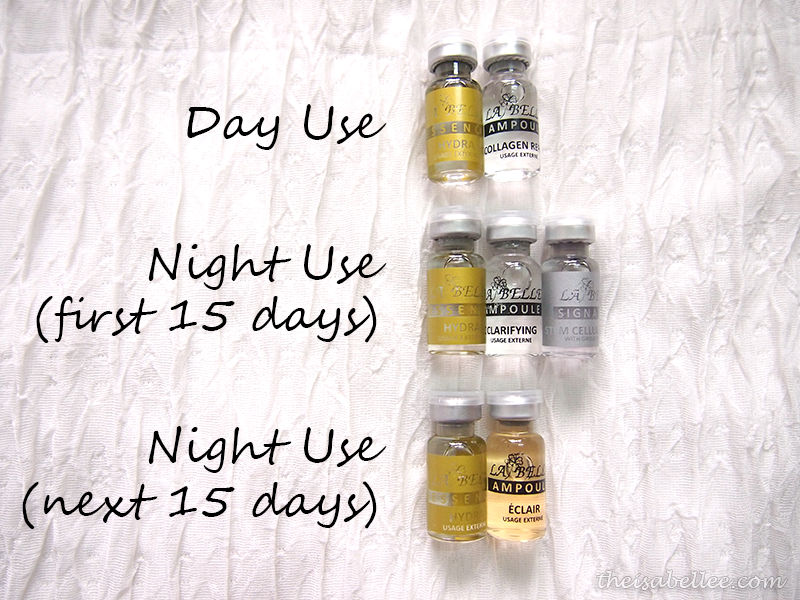 Because my skin is just dry dry dry, I have to use the Hydra Essence day and night. So this is my daily routine which was designed for me. Basically it is meant to give me moisturized skin that is spot-free. 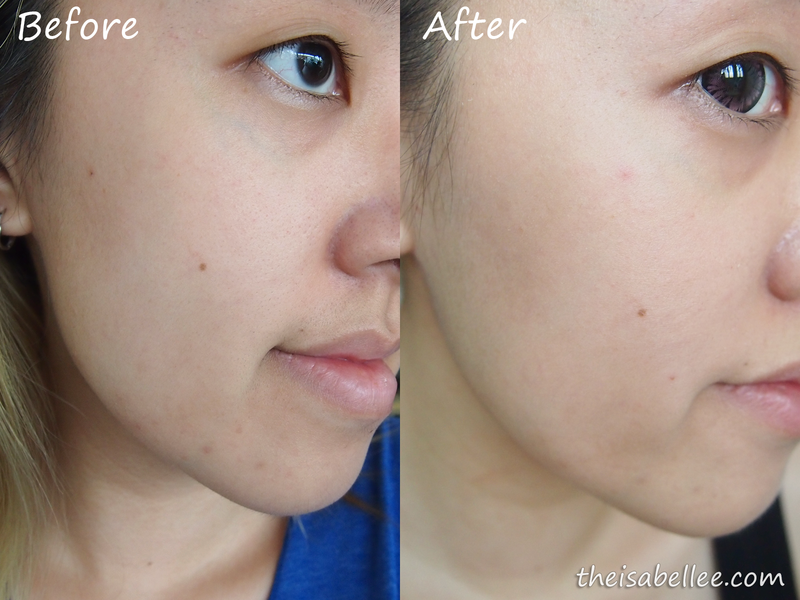 After using for 1 month, my pimple scars around the chin area were lighter and overall skin complexion looks clearer. Also, the Hydra essence provides instant hydration and is great for dry skin. 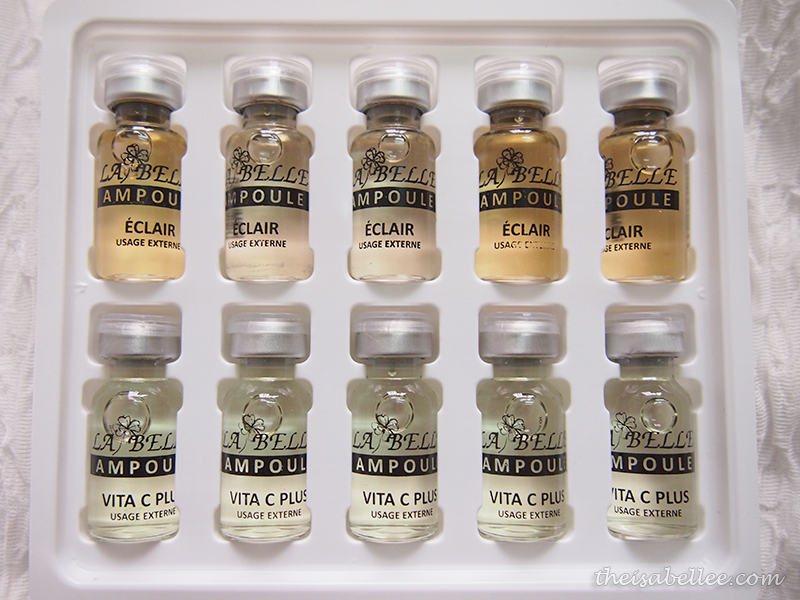 You can clearly see the lines are more apparent without the La Belle Hydra Essence. I applied both to one side of my face and packed on liquid + powder foundation here. Without, the makeup is pasty and cracked with skin peeling off. With, 70% better! So it's true but you do not have to spend a fortune on them. Also, results are better if you use them for 10-15 days before your photoshoot, not immediately before. They're not troublesome for traveling. Just use the original packaging to store them. 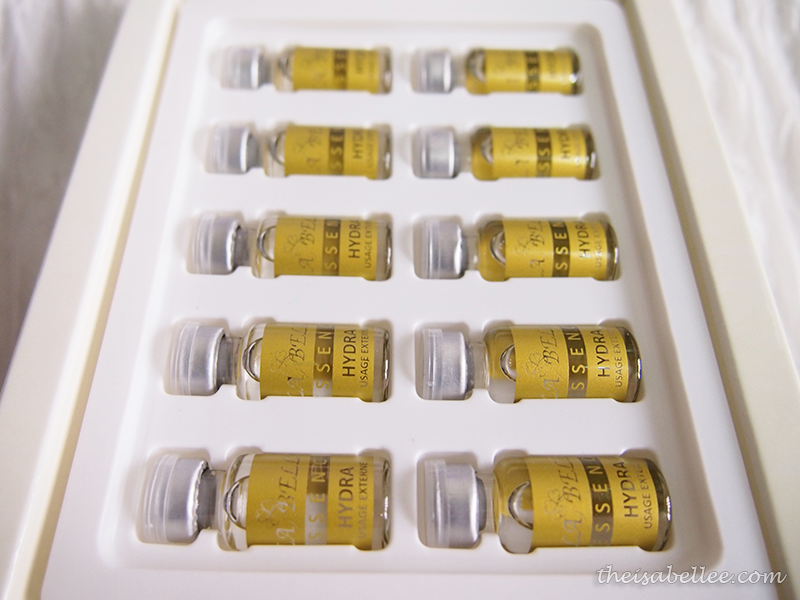 The rubber cap can be reused to close the bottle or you can transfer them out to small vials with droppers.